Prints adorn the paint chipped walls of my bedroom - though the first each person notices is a photo of New Hampshire's fall colors. A decent image, it's certainly not my best work. Standing alone, it could never incite the look of astonishment seen on the face of each visitor. Truly extraordinary, however, is what lies behind the 12x18-framed print: an impossibly thin source of completely uniform light. The PhotoGlow backlit picture frame's intuitive design is a result of optical physicist Ed Sinofsky's years of experience designing similar devices for use in the medical industry. The device, simple in concept, is essentially a miniaturized fluorescent light box. Powered off, the PhotoGlow frame is indistinguishable from a standard framed print - assuming you fail to notice the super thin power cord, which you likely will. The device, which is less than one inch thick, is no heavier than a quality picture frame, and mounts just as easily. Ed Sinofsky, who currently holds 48 patents, most in the medical applications of light, earned his Ph.D. in Optical Sciences at the University of Arizona in 1984. Now living in Cape Cod, Sinofsky, who wanted to explore the artistic side of his career, founded PhotoGlow, Inc. in 2003. Sinofsky's frames range in size from the 5x7 "desktop darling" to a 24x36 wall mounted unit with prices ranging from $79 to $399 respectively. Other costs to consider are the custom made PhotoGlow print media ranging in price from 89 cents per 5x7 sheet sold in packs of ten to $12 dollars per 24x36 sheet sold in packs of five. You can also upload an image file and receive your print along with your frame in the mail. A 5x7 print costs $5.99, and you'll pay up to $45.99 for a 24x36 print. I purchased my frame along with a print, and I'd say the option is advantageous for several reasons: My print arrived looking just as expected - there were no surprise color deviations*, crops, or pixilation. Images are printed on PhotoGlow media using high quality pigment-based inks, so prints will last much longer than with dye-based inks. The print I received is so sharp that many people mistake the frame for an LCD screen. If you like to change things up once in a while, it's easy to swap prints through the rear of the unit. Although very durable, the frame is still susceptible to damage. Unfortunately, I only have one PhotoGlow to play with, so I'm not going to destroy the thing, but Sinofsky tells me a drop from the wall would result in damage no less devastating than that with a laptop dropped from the same height. The PhotoGlow isn't perfect - but try finding me something that is. My frame was expensive - the 7lb., 1-inch thin, 16x22 inch frame (matted to 12x18) cost $175 including a print, $15 dimmer switch accessory, and shipping charges. One thing that really irks me about my PhotoGlow is that in order to change the brightness (you need the dimmer option to do this), you have to remove the unit from the wall - though Sinofsky is currently working on a solution to implement in future PhotoGlows. Despite the unit's power cord being long and thin, I'd still like the freedom of battery power. Be on the lookout - Sinofsky says a battery powered PhotoGlow may be available in the not-so-distant future. If you're interested in purchasing a PhotoGlow, you can do so on their website at http://www.photoglow.com. 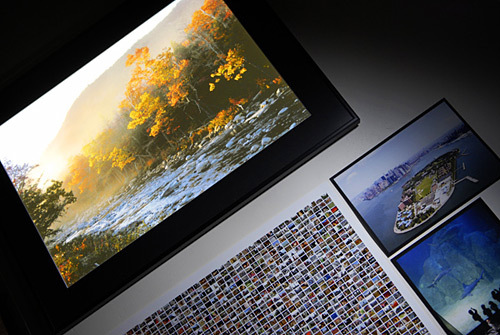 Despite 3500 frames sold in the first four years of business, PhotoGlow remains a one-man show. You can email the inventor, assembler, and tester at ed@photoglow.com. SportsShooter.com members are entitled to a 10% discount on all products - use "sportsshooter" in the promo field during checkout. *I noticed that with my PhotoGlow print, blacks appear as a dark gray. This has more to do with the fact that a small amount of light can still shine through rather than a printing defect. An easy work around to the problem is to layer two identical prints - this helps darken the blacks without losing much brightness overall.